The only alternative place in the fake hippie village of Matala. Looking for old hippies and music lovers - they will all be at the Mermaid's. Concerts every evening - and a good choice of bands I'd say! The true spirit of Matala! Mermaid cafe has been our favorite destination in Matala since it's early days in 2011.Unlike the other bars of the area,in Mermaid you can come across live music almost every night at summer,and DJ sets from all over the world!The prices are cheap,especially considering that most of the drinks served are biological from local producers.The staff-and the owner Pavlos- are friendly and open minded and you will feel that the whole bar is part of a big company of friends from every country and of every age!Thank you Pavlo for keeping the spirit of Matala alive and give us moments to remember!Until we meet again this summer! Wonderful vibes. Very good prices. 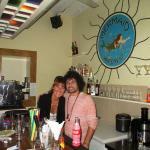 A special alternative choice in nightlife of Matala. Ask for raki. The best. Fantastic little bar that plays really good music and serves draught beer at a very reasonable price. Very good juices & friendly people ! Not expensive +- 3 euro . Nice , small cosy bar. Certainly worth the stop. Been to Mermaid Cafe? Share your experiences!